If you have ever dreamt about having a conversation with a machine, just as it happens in some of the most legendary science fiction films, you have to try to download Cleverbot. 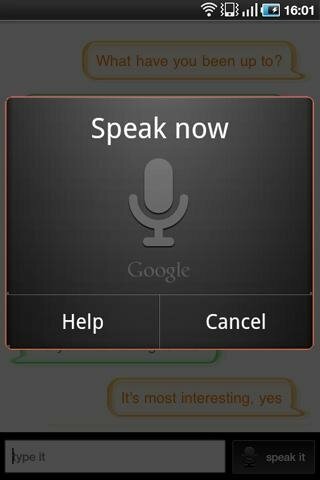 With this application you will be able to maintain entertaining conversations because it will be able to answer any of the things that you say. 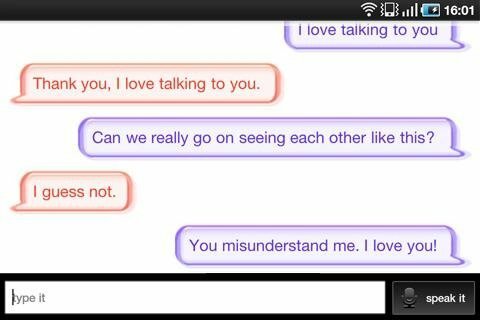 With Cleverbot you'll be able to choose between writing or speaking to the application. In any of the two cases the application will answer with a hilarious variety of arguments that will allow you to maintain conversations with it for hours on end. Its design is based on an advanced artificial intelligence system that will make it possible for it to answer with coherence, even though with a certain degree of fun, to what you say. Cleverbot has a chat system in which conversations are represented in balloons, the colors and shadows of which you'll be able to customize, as it's possible in many other instant messaging applications for mobile phones. And if you find a conversation worthy of being remembered and shared, send it to whoever you want by email. 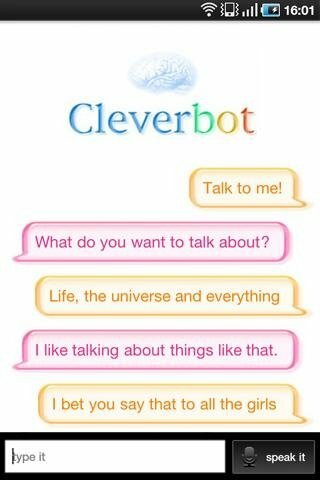 Download Cleverbot and enjoy entertaining conversations with this application. Requires Android 2.3.3 or above.